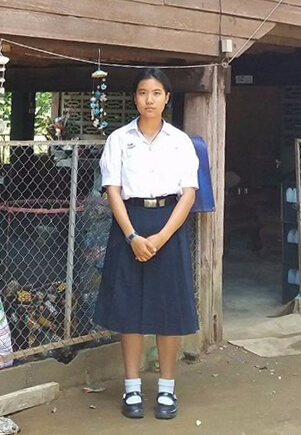 Sadly we were not able to continue our sponsorship of Pakjeeraporn into her upper school years. Her mother decided that due to the work options in their local area her only option was to move to a different district. This sadly took them into an area which EDF does not currently cover. As sad as we are that we can’t continue what we started we hope that this positive move will benefit them all. We are very happy though to have started supporting another student, Piyarat. Below is the letter she sent in application for the scholarship process. As you will see the financial help will be vital to her and her father. My family has 3 members, my father, my elder sister and me. Although my family is not financially adequate, we have warmth and love for one another. I am currently studying in Secondary School Year 4 and my sister is studying in the 4th year in the Faculty of Medicine, majoring Public Health Science, University of Phayao. All household and education expenses fall solely under my father’s shoulder. My father’s job is a freelance painter. He can earn 9,000 baht per month. The income is not enough. So we are short of money sometimes. I have to save money on daily expense in order to loosen up the load of my father. I do household chores such as cleaning, washing clothes, or washing dishes so that my father would not be too tired. Sometimes if my father has to go to work in another province, I will need to stay with my aunt. My aunt’s job is sewing. Her average monthly income is 5,000 baht. If we are short of money in any month, she will help us with some money. 1) I will put one portion in the bank to save it for the education in the undergraduate level. I would like to study in the Faculty of Education. And I think there might be more expense involving in the study. So I would like to save some money for it. 2) I will use one portion to lighten up the expense load of my house such as water bill and electricity bill in some months. 3) I will use the last portion for my current study such as tuition fee or transport expense to travel to school. Even though I still cannot repay the favor of my father and my aunt with my own strength or money, I will do the best of my current duties which are focusing on my study, being a good child for them, being a good student for my teachers, and being a good person for the society. I believe that I will be able to put the granted scholarship to the best use. I will become a good teacher for the society in order to repay the favor of my father and my aunt. And I will take care of them when they get old as good as possible repaying the favor that they have taken the best care of me until now. We donate 20% of our profits to this education charity, helping us currently sponsor 3 students. Take a look at our silver jewellery and help us help them.